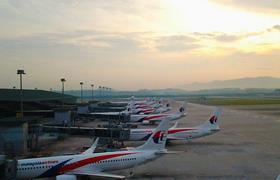 KLIA (Kuala Lumpur International Airport) is the largest international airport in Malaysia. It serves the departures and arrivals of various international and domestic flight. It is located at 60 kilometres away from Kuala Lumpur city and it is nearby, federal administrative centre of Malaysia, Putrajaya and Sepang area which is the venue for Malaysia Formula One Grand Prix. Comparing to the neighbouring airport, LCCT, KLIA has much better airport infrastructure like retail shop, environment, sofa to provide comfortable waiting period for passengers during departure and transit. There are two ways to get to KLIA from Kuala Lumpur, either by train or by bus. If one is taking train, KLIA Express, you may choose to depart from KL Sentral, or Terminal Bersepadu Selatan station. Taking train is the fastest and hassle-free ride comparing to bus. But the drawbacks for taking train is that the schedule frequency is not as high as bus schedule frequency, and train fare is more than double of bus fare. Bus to KLIA comes with options of buses like Star Shuttle and Airport Coach. Star Shuttle departure point is at Pudu Sentral, whereas Airport Coach departure point is at KL Sentral. The fare is only at cost of RM 10 per trip. Frequent bus schedule and competitive bus fare are the advantages of taking bus. The coach bay in KLIA is quite a distance away the airport departure hall, so one might get missing in the airport. Please refer to reference site to find the direction from coach bay to airport departure hall. For passengers from Singapore, Golden Coach is the only bus operator providing bus service from Singapore to KLIA (with transit at Pudu Sentral). For more information about Bus to KLIA, check out details from us today!